In case you haven't heard yet, Ariana Grande and Pete Davidson are engaged. Reports first emerged earlier this week that the couple are set to say 'I do' after "a few weeks" of dating - and fans were pretty shocked by the news. Neither the singer or the SNL funnyman have actually confirmed the news - although Ariana has hinted at it on social media, liking a few tweets congratulating her on the news. However, it appears that Pete has now confirmed the news with a short-but-very-sweet post on Instagram. He posted a black and white photo of himself and the One Last Time singer, with her hands placed over his - and Ariana's reported engagement ring front and center. Fans soon flooded the comments section with well wishes for the couple, especially after Ariana added: "so much better". 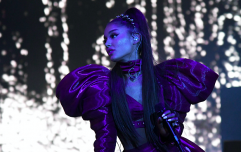 The No Tears Left To Cry singer and the SNL funnyman first went social media official with their relationship in late May. Despite their constant back-and-forth flirting on social media, this was the first time they had actually been pictured together. Since then, they have been sharing multiple loved-up posts - and Davidson even got two tattoos dedicated to the singer.